Every car company needs a flagship product that can demonstrate its technology and design prowess to the world. And in 2016 the best way to do this is with a crossover or a SUV. And a flagship is exactly what Tata Motors is going for with its new Hexa. At first glance, the Hexa might look like a facelifted Aria, but the changes are far deeper than just some new body panels. In fact, you could call this an all-new car. The Tata Hexa car has been launched at a price of ₹ 11.99 lakh. Let's start with the design though. The Hexa is the second car after the Tiago that gets what Tata Motors calls the ‘Impact’ design language. And if impact is what the Tata design team was going for, I think they have pretty much nailed it. 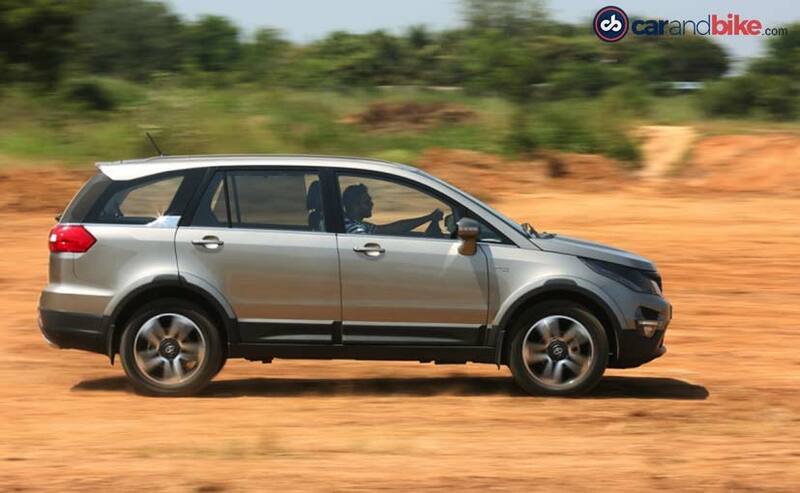 The sheer stance and road presence of the Hexa is immense – far greater than what the Safari Storme pulls off. The large gloss black front grille gets two distinct border slats, the bottom in chrome and the top in black that connects the two swept back projector headlamps. The lower half of the bumper gets a large central grille that has a wraparound accent painted in shade of matte grey. The fog lamp and daytime running lights on the bumper too get their own little grilles and on the whole I think that although there is just a hint of crossover-ness that the Hexa has, this is about as butch as a crossover can ever get. A plastic cladding dominates the lower portions of the Hexa and combined with the wider wheel arches and the door trims, it makes the car look a lot more aggressive than it would have otherwise. The side profile is also dominated by the sloping roofline that travels up right at the very end. There's also the chrome accent piece that carries the Hexa badge right behind the C-pillar. The rear end of the car has two large horizontally placed LED tail lamps with a really cool lighting and a large chrome accent piece that runs across the tail gate. Similar to the front, the rear too gets a matte grey scuff plate and two trapezoidal exhaust tips. And then we come to my favourite part of the design – the 19-inch wheels! I am so glad that Tata has decided to choose something classic and simple like these 5-spoke wheels in a two-tone black and polished shade instead of choosing something unnecessarily ultra-modern and ruining the design package. Not only do they look great standing still but the polished wheels look even better in motion. The sheer step up in design and quality are obvious when you step into the Hexa. 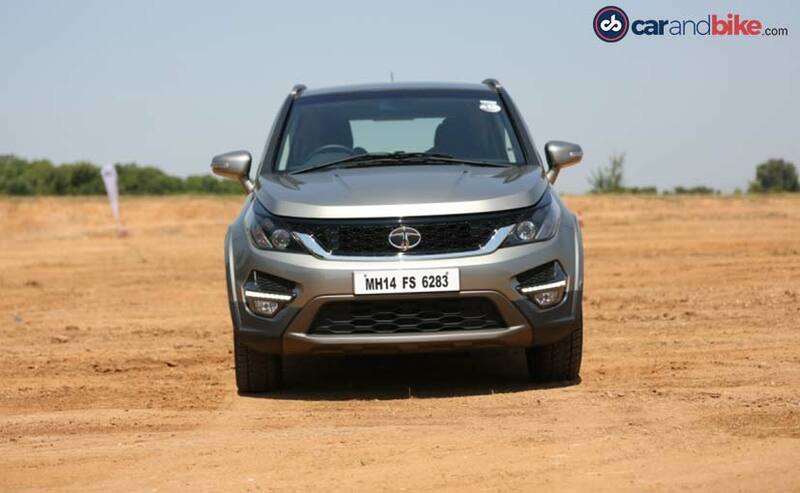 Shut lines and the overall quality of the plastics and materials used are by far the best we have ever seen on any Tata Motors vehicle in the past. Its great how consistently we have said this of all the recent Tata products - meaning with each car, the company is taking big strides off late. The all-black interior gets a hearty dose of leather on the dashboard and on the door panels along with the leather seats on the top of the line variant. The seats are not only well designed but also feel top notch in terms of their tactile feel with a really good grain of leather running through as well. My only grouse is the slight lack of shoulder support on the front seats and the fact that the padding seems a little harder than it should be. The central console gets a touchscreen infotainment unit with navigation (that syncs with your smartphone) and an array of options including bluetooth and smartphone integration. 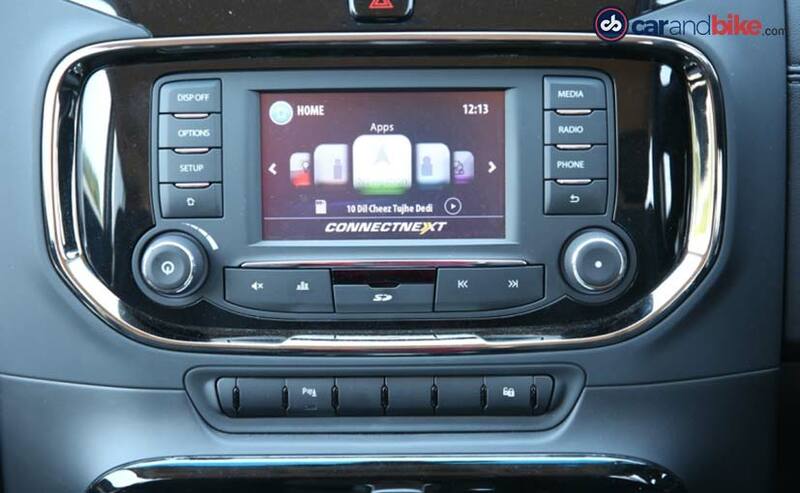 There is no Apple CarPlay or Android Auto but the Hexa does offer an app based control system that helps you play your collection of songs from a Juke-Car App - similar to the one in the Tiago. The app also has systems like service and diagnostic tools, navigation support and options to choose the ambient lighting (of which there are eight colour options). The multi-functional steering wheel gets cruise control, audio and telephone controls, and is height adjustable. The simple gloss black console combined with a chrome wraparound is pleasing to the eye and so are the well placed chrome/brushed aluminium accent pieces around the dashboard and the AC vent. 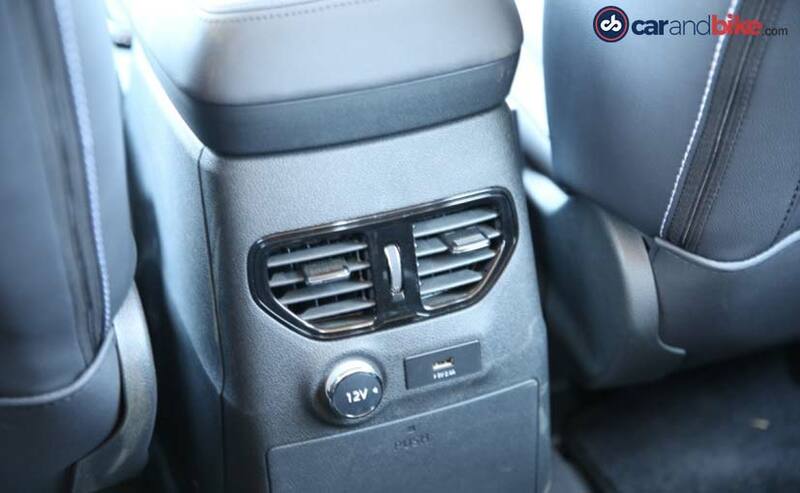 The climate control knobs are placed slightly lower than they should have but you do get used to them very quickly. The horizontal central console on the automatic houses the gear shift lever enclosed in a black bezel. You get just one cup-holder and no real slot to place your smartphone apart from the central flip up storage space between the seats. 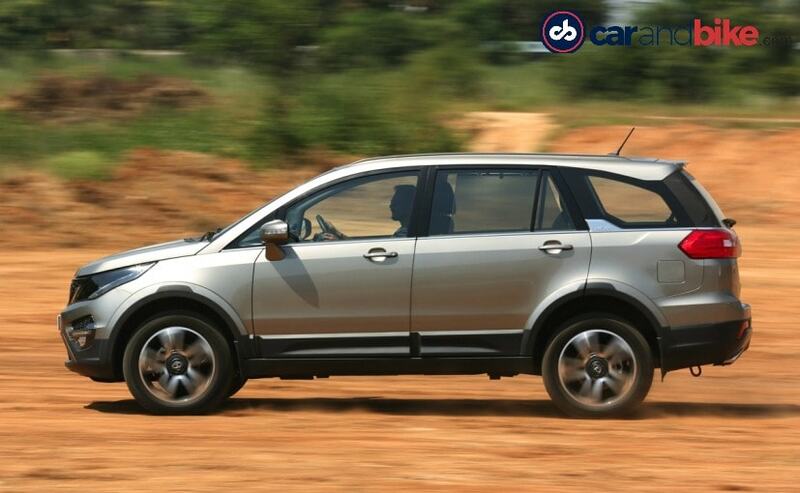 Mechanically, the Tata Hexa is very similar to the Safari Storme. For example, it gets the same 2.2-litre, four-cylinder, turbocharged diesel Varicor engine that makes 156bhp of max power and 400 Nm of mighty torque. The engine is mated to either a six-speed manual or a six-speed automatic gearbox. The manual gets the option of both a rear-wheel-drive and an all-wheel-drive driveline whereas the automatic is only available in a rear-wheel-drive configuration. The Hexa with the manual gearbox gets the driving mode options that changes the amount of power and torque the engine makes. For example, in comfort mode, the engine makes 150 bhp of power and 320 Nm of torque while in the sport mode, the engine makes the full 156 bhp and 400 Nm of torque. 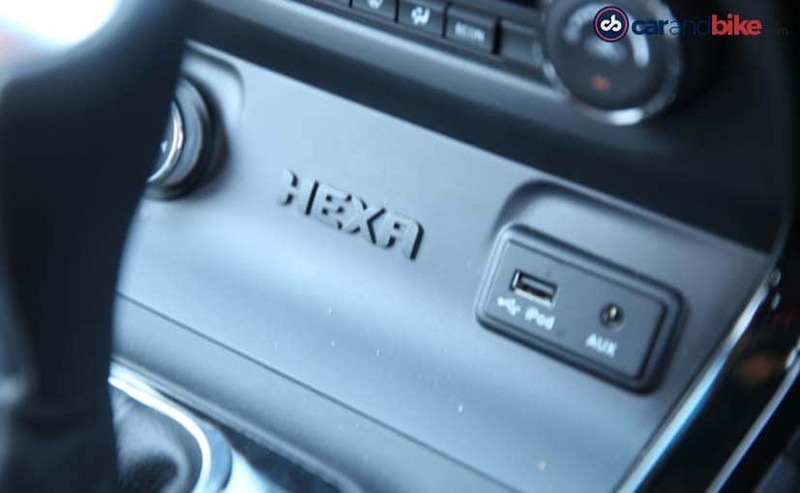 Now while this might not be immediately apparent to the average consumer, there is a noticeable difference on how driver friendly the Hexa gets especially around the mid-range. The modes also change the ESP efficiency and traction control settings on the Hexa which means a little more leeway for spirited driving in the sport mode. There is also a ‘rough mode’ that is essentially an off-road mode that gives you better power at lower revs and a less intrusive ESP setting that gives you a lot more leeway when one (or more) of your wheels lack traction. Power delivery isn’t what we would call hectic and the clutch could have certainly been better in terms of both its overall feedback and free play. The Hexa is not what we would call fast though as with 2280kg of kerb weight to move around, it does take some time to get up to speed. But, its isn’t painfully slow either and once you do get it going, mid range performance, especially on a highway is impressive. 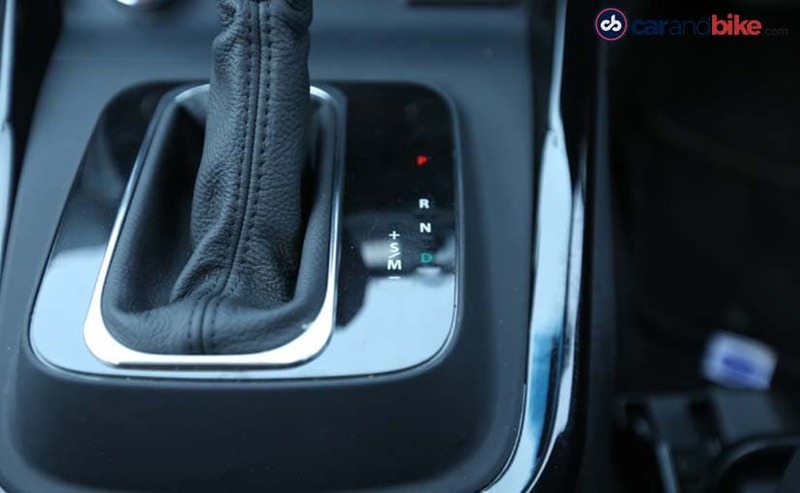 The automatic gearbox is the one we would choose as the Hexa is the kind of large car that truly comes in its element with an autobox as it just takes a lot less effort to drive. Yes, it is slower than the manual but then the Hexa is not meant to be a sportscar either. The gearbox is surprisingly smooth and there are no jerks in between shifts (while upshifting or downshifting). The actual gear level in the automatic does require a little more effort than usual to operate – something Tata should look into and improve immediately. The automatic does not get the driving modes like the manual but does get a ‘sport’ option on the gear shifter that makes it rev higher and downshifter faster than in the standard ‘drive’ mode. There is also a tip-tronic setting where one can manually shift gears but with an SUV like the Hexa, you will rarely use it. The automatic also lacks the ESP and traction control options and that is something we think Tata Motors should not have skimped on. The automatic also does not get an all-wheel-drive option which we think is fine since the Hexa with both an autobox and AWD would just become too expensive (and heavier) and would not have any takers. 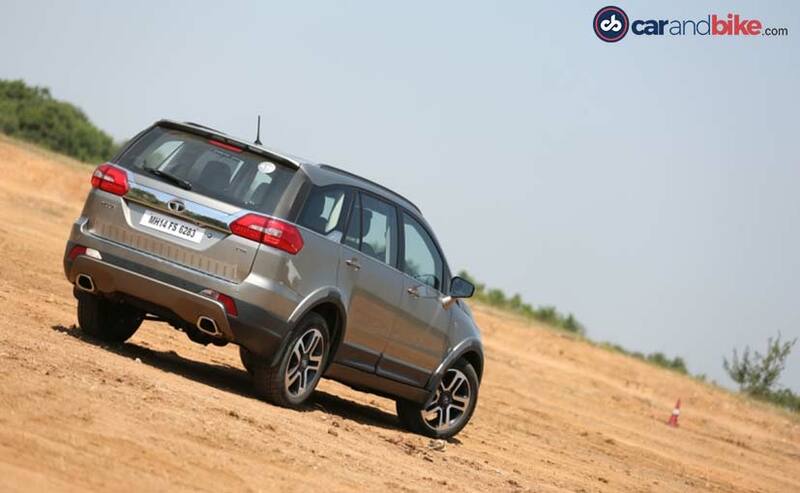 The Hexa’s sheer weight does come into play when you drive the car and it does seem to take a lot more effort as compared to most of its peers. At standstill, the power assisted steering does feel a little heavy and this could be a problem when it comes to parking it in tight spots. Get it going though and the steering effort becomes much better and the steering weighs up just enough at higher speeds to make it easier to drive. 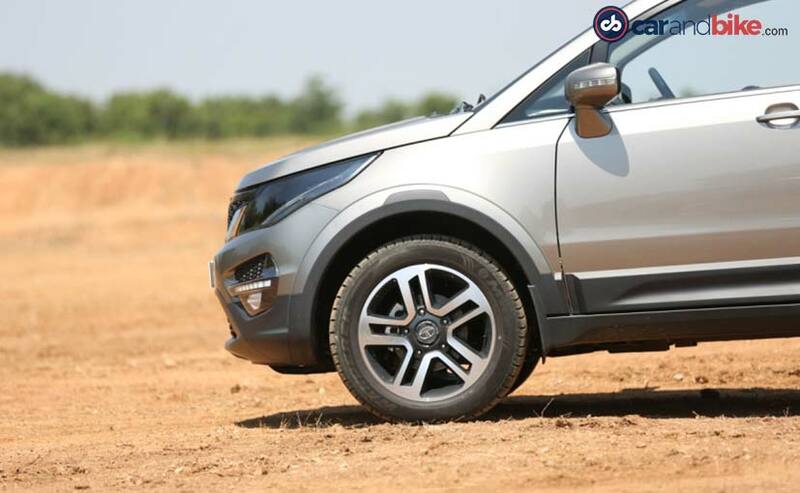 The 19-inch wheels seem to have dramatically altered the way the car drives in terms of overall handling and the Hexa feels a lot less vague as compared to the Aria or even the Safari Storme. And now we come to what is possibly the cherry on the cake – ride quality. The Hexa’s sheer ride comfort is very impressive and although there is a hint of bumpiness at low speeds, get the SUV above 50-60kmph and it glides over bumps and potholes like it doesn’t exist. The Hexa is stiff enough to handle the several roads obstacles that all our Indian streets have and yet pliant enough to feel very planted at high speeds. That said, there is some noticeable body roll when you take a corner at higher speeds. We do have a bit of concern with the pedal feel that the brakes offer. Yes, the Hexa does get disc brakes on all four corners and the SUV will brake efficiently when you slam on the brakes, but at slower speeds, pedal feedback is lacking and could do with a bit faster response. 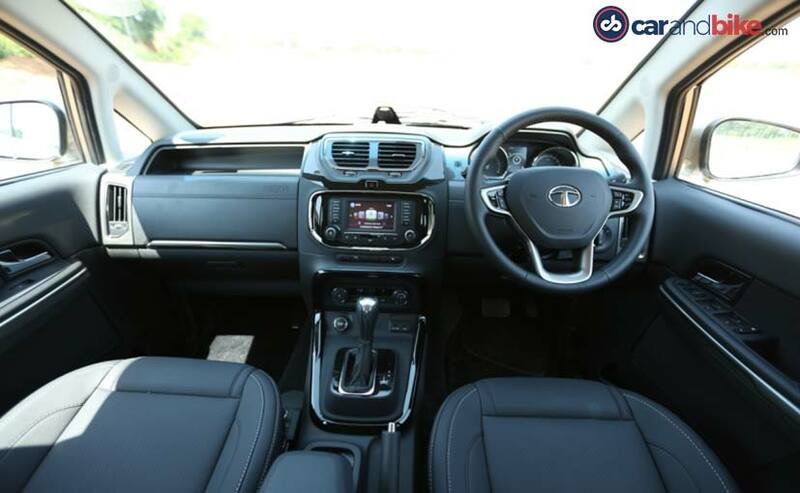 The Hexa as a package is a Neil Armstrong sized leap for Tata Motors when it comes to quality and design (especially on the interior). It is heavier than it should have been and that does affect on-road performance but as a comfortable people carrier, the Hexa could give the Toyota Innova a run for it’s money. 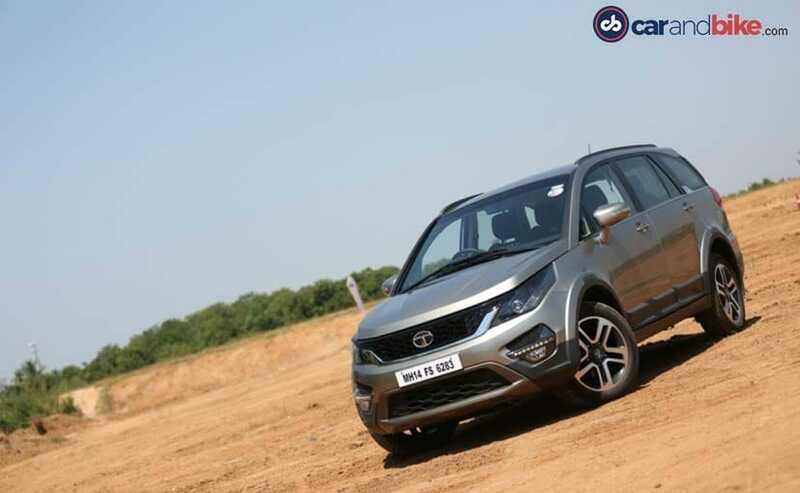 With its sights trained squarely on the likes of the Mahindra XUV500 and even the Hyundai Creta to a certain extent, the Tata Hexa is an honest product that deserves to do well. 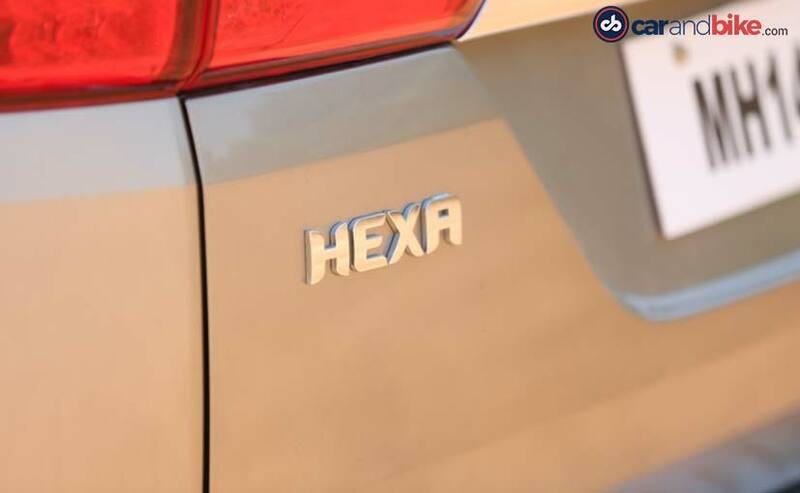 Bookings for the Hexa have opened and we do hope it is priced between Rs 12-17 lakh when it goes on sale. And also hope it impresses the Indian customer as much as it has impressed us.